My life was very different two years ago; it was the summer before college, and I was excited to embark on the journey of higher education. I was nervous, excited, and I spent my free time dreaming about the college experience. New friends, new experiences, and no parental supervision. How much better could life get? I remember receiving friend requests from other incoming freshman, it was exciting to connect with future classmates before arriving on campus. We would converse quite a bit, and could only speculate what life would be like. I joined the “Class of 2013” group on Facebook – I would stalk my future classmates, and it only caused me to be more excited about what the future had in store. Fast forward. It’s two years later. I transferred to UMaine, and have been pretty happy with the school (even though I believe higher education is failing students). The one glaring downfall of UMaine is their lack of social media awareness (specifically on Facebook) – it is very decentralized, with pages popping up for different departments constantly. The “go-to” page (UMaine Admissions) only has 1,300 fans, and they have yet to learn that the old-school method of push marketing (advertise, advertise, advertise) does not work on these channels. I have become a little disgruntled; I believe UMaine offers an education that can compete with many other schools in the Northeast, yet is being hampered. Push marketing isn’t working anymore – Instead they need to focus on engagement. Stop selling, and establish a dialogue instead. Little Fish, Big Pond – High school creates social classes, college destroys them. Individuals who are used to “running the school” now have something to prove, or else, they will be nobody. Who wants to be unknown? **New Friends – **College offers the opportunity to meet new friends, it can actually get pretty overwhelming at times. At a large school like UMaine, kids are forced to find other students who share their interests. As a result, incoming freshman are willing to share information about themselves in an effort to find their niche. The Party Factor – Incoming freshman want to party. They just escaped from parental supervision, and life is spectacular. Now they wanna hook up – the guys have to prove they are the alpha dog, and the ladies do whatever ladies do to make sure they are seen by the men (Whatever that entails). Fresh Start – Many students are particularly excited about the opportunity for a clean slate. The mistakes they made in high school are no longer evident, and they are free to start fresh. 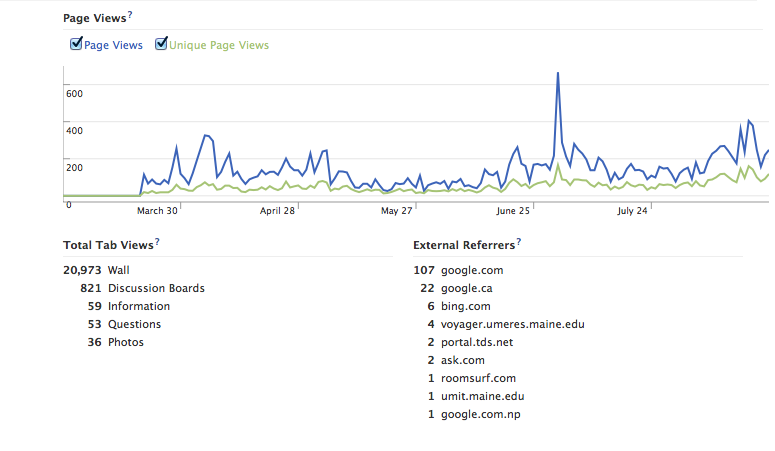 As of today (August 18th), the UMaine Class of 2015 page has 573 fans, which is pretty decent considering the growth of the UMaine Admissions page over the past few months. Take note, the UMaine Admissions page is visible on the homepage of the UMaine website (see screenshot below). According to the Princeton Review, UMaine has about 1,700 incoming freshman every year. By the time school starts, I fully expect to have over 600 students connected to the page. Not horrible considering all promotion was done solely using Facebook. This is where the stats get interesting. According to Facebook Insights, the wall tab has over 20,000 views, an average of approximately 40 visits per fan. July 1st was the busiest day, with 667 page views by 166 different people. Who is the page targeting? Take a look below. 89% of people connected are between the ages of 13-24. It’s difficult to quantify conversations, yet looking back, I wonder what ROI was achieved? Perhaps one student is now attending UMaine after meeting another incoming freshman through the page? I’ll never know. Over the life of the page, posts have been seen over 100,00 times, with over 2,500 interactions (“likes” and comments). I am extremely happy with the interactions, incoming freshman are responding. It’s a real conversation! I love Facebook Questions – they are a great way to gain insightful quantitative results. I asked a variety of questions – the one that received the most feedback was “Mac vs. PC?” with 307 votes. This page could follow incoming freshman throughout the year, gaining quality feedback on issues/highlights of the first year experience. It’s important to keep these students happy (or as much as possible), and hopefully decrease drop-out/transfer rates. I hope you (the reader) found this blog post informative and helpful. My purpose was not to “get back at UMaine” but instead highlight the great aspects to incoming freshman, and to create a case study. UMaine administration – if you are reading this, I am more than willing to give you control of this page to keep students updated, especially with move-in weekend coming up!